The V2 Vertx Plus is a new generation cigalike that combines the simplicity of entry-level vaporizers with advanced features like adjustable voltage and disposable pods. 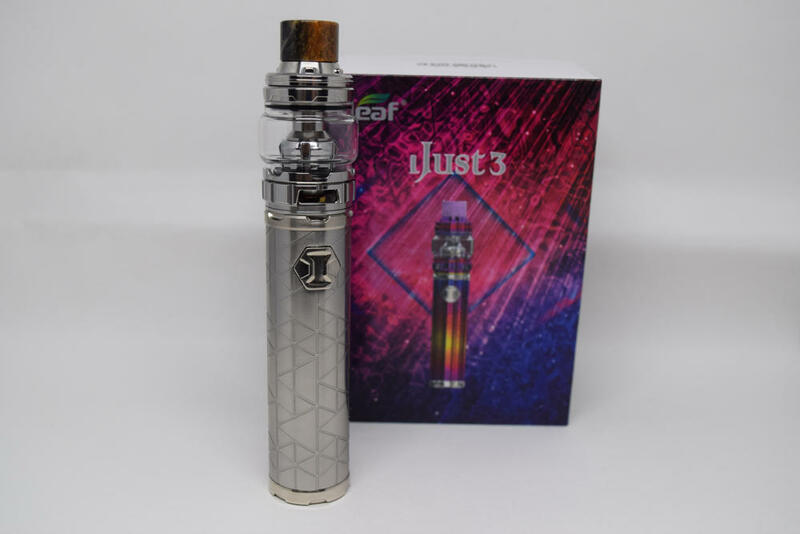 It also boasts a larger capacity battery than V2’s basic electronic cigarettes, a slick, futuristic design, and, last but not least, touch screen controls. In this review, we’re going to take a close look at the Vertx Plus to see how it stacks up against other e-cigarettes in its category and ultimately find out if it is as revolutionary as V2 Cigs claims its. V2 Cigs have always put a lot of effort into the design and quality of the packaging, and the Vertx Plus is no exception. Instead of the usual rectangular cardboard box that most companies use these days, V2 went for a cool-looking triangular magnetic box that splits open to reveal the contents. I have to say this is one of the most inspired packaging designs I’ve seen in a long time, and while it doesn’t influence the performance or quality of the actual product in any way, it makes for a great first impression. 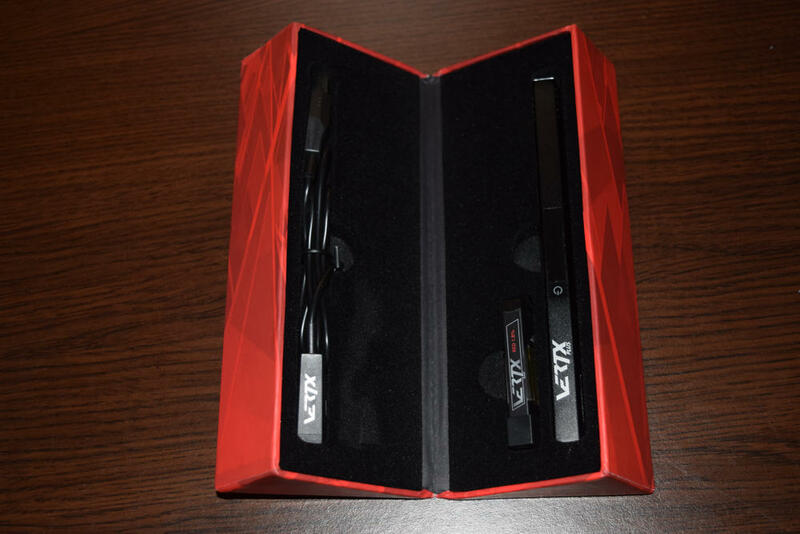 Inside the box we have the V2 Vertx Plus unit, a magnetic USB charging cable, two pre-filled e-liquid cartridges and a user manual. It’s a pretty basic package, to be honest, but it includes everything you need to start vaping immediately. 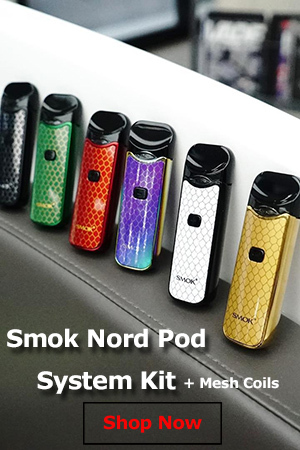 I would have loved for this to be a two-unit starter kit, so you could keep vaping on the go when one of them runs out of power, but the single device kit seems to be the norm nowadays. That means that you’re either going to have to purchase an extra Vertx unit, or make sure you charge it before going out. 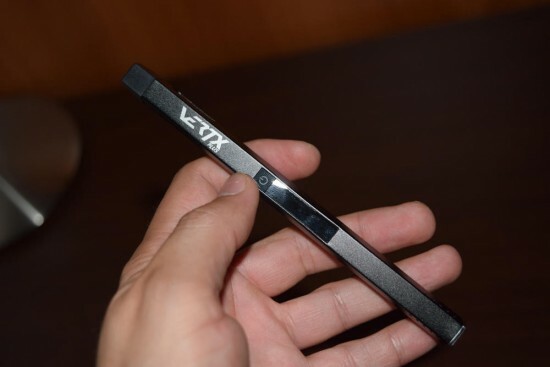 The V2 Vertx Plus has a rounded pen-style design, with one flat side which comes in handy when you want to set it down somewhere to make sure it doesn’t roll off. 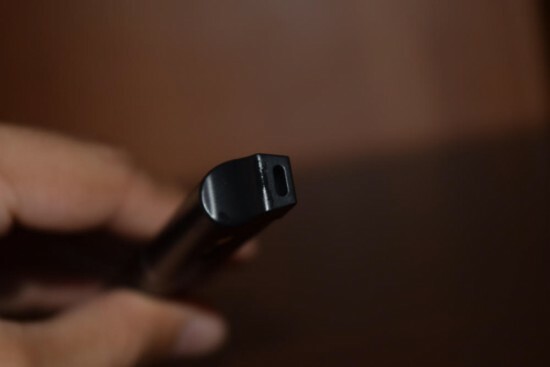 Like the V2 Pro Series 3, the top part of the unit is merely a metallic sleeve for the cartridges, while the lower part features five LED battery indicators on each side, which light up depending on how much battery you have left. When you press the power button and the battery is fully charged, all lights turn on, and as it gradually depletes, you’ll notice the lights going out one by one, until just one of them lights up on each side. The power button and touch screen sit flush on the flat side of the V2 Vertx Plus. It’s important to note that the touch display is available only on the Plus version, and not on the regular V2 Vertx. the power button is nice and clicky, has no rattle at all, but it’s really, really small, and because it’s flush, it can be a bit tricky to operate, especially for someone with large fingers. While I can understand that making the button flush prevents accidental firing when storing the device in a tight pocket or a purse, I think they could have at least made it a bit larger. It’s not a major defect, but having to use your thumb nail to press the button after multiple attempts to press the button all the way down just with your finger can be frustrating sometimes. The LED touchscreen is definitely one of the most intriguing features of the V2 Vertx Plus. It might seem like a gimmick, as they could have easily used the classic ‘+’ and ‘-‘ buttons we see on most other vaporizers, but in an age where touchscreen smartphones are so popular, this feature kind of makes sense. I see it as a glimpse into the future of vaping. 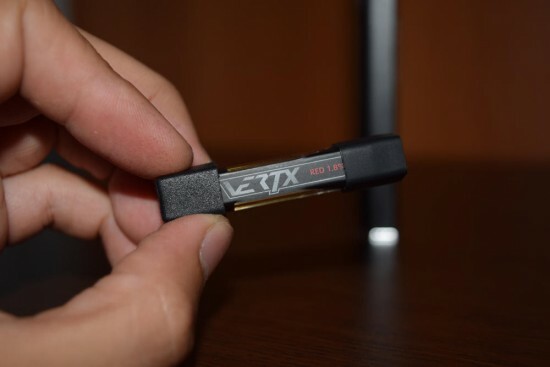 As I mentioned in the beginning of this review, the small touchscreen display lets you adjust the power output of the V2 Vertx Plus – 3.5V, 4V and 4.5V – by sliding your finger upward or downward on it. However, getting into settings mode requires a look at the user manual. At least I wasn’t able to figure out how to use it before reading the instructions. Once the vaporizer is turned on (by pressing the fire button three times in rapid succession), you can put it into settings mode by pressing the fire button two times quickly. You’ll see the button flashing white and two small icons showing up intermittently at the bottom of the touchscreen – a small lightning for power, and a small sun for brightness. Pressing the power button again while one of the icons appears will let you adjust either the voltage or the brightness of the LED lights. You do this by simply sliding your finger upwards or downwards on the touchscreen. It’s definitely not as advanced as a smartphone touchscreen, but it is surprisingly responsive, detecting even the slightest finger swipe. Once you’re done making the adjustments, press the fire button again to exit. 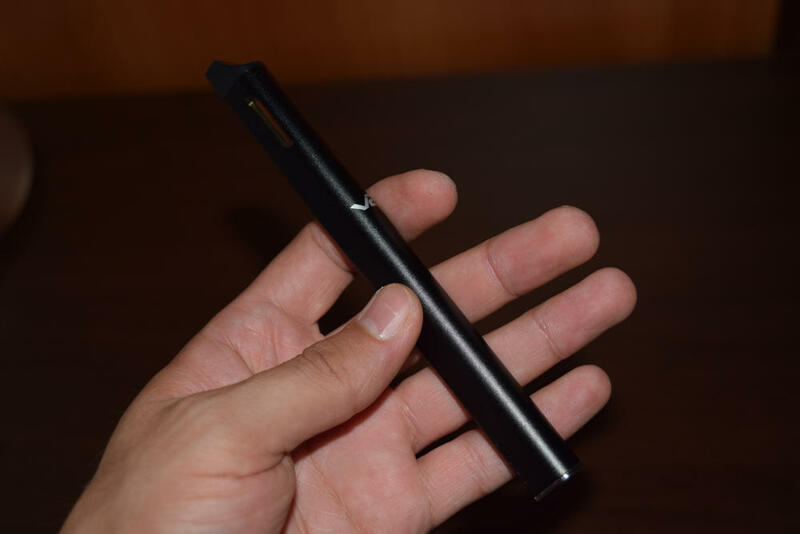 Another distinctive feature of the V2 Vertx Plus is the use of magnetic connections for both the charger and the e-liquid cartridges, instead of a micro-USB port and the popular 510 connection. To connect the charger, simply bring it close to the small magnet on the bottom of the device, and it will snap into place. Then just plug the other end of the charger into a USB port and you’re done. The cartridges are just as simple to work with, just slide them into the metallic sleeve of the Vertex, with the magnetic connection facing downwards, and they snap firmly into place, Then, when you need to replace a cartridge, simply pull it out gently and insert a new one. 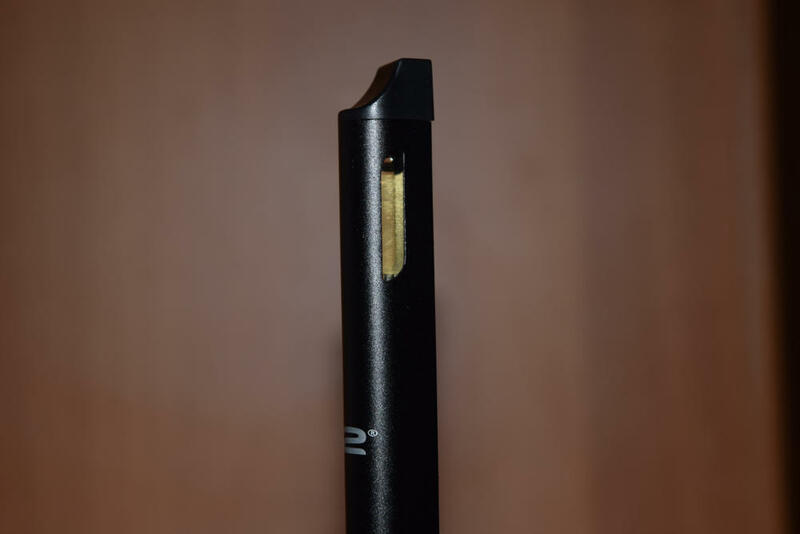 The magnetic cartridge system has been used by V2 Cigs before, on their V2 Pro Series vaporizers, but this time around they come pre-filled, whereas with their older devices, you had to add your own juice, or by V2 e-liquid separately. The cartridges hold 1.2ml of e-liquid, which seems very little compared to the juice capacity of advanced tanks like the SMOK TFV4 or GeekVape Griffin 25, but for a device aimed at beginners that doesn’t produce big clouds of vapor, it’s actually pretty decent. V2 claims that a cartridge will last up to 650 puffs on the lowest voltage setting (3.5V) and from my experience, their estimate is pretty accurate. I didn’t actually count my puffs on the Vertex Plus, but I’m pretty sure I got about 400 of them on the highest setting (4.5V). 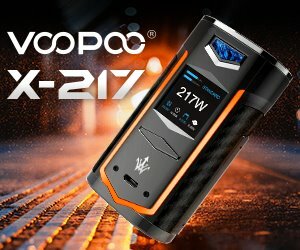 Cigalikes never had an impressive battery life, but the V2 Vertx Plus actually has a decent 420mAh battery under the hood. It’s not impressive by any means, especially when compared to direct competitors like the Eleaf iCare or Joyetech eGo AIO, but it’s definitely a lot better than any cigalike device. Add the fact that you can use it at a minimum setting of 3.5V and you actually get a few good hours of use out of it, maybe even a day if you vape conservatively. Plus, the USB charger also allows you to use the Vertx Plus while it’s charging, so you don’t need to worry about battery life all the time. Using the Vertx Plus exclusively at maximum power output, I got about 5 hours of use out of it, but keep in mind that I’m what you would call a heavy vaper and usually use advanced dual-18650 battery mods. So you can say I was really pushing it during those 5 hours. A casual vaper, or a fresh ex-smoker could easily get around 8 hours of vaping out of it, maybe more. A good thing about the V2 Vertx Plus, compared to other similar devices I’ve used recently, is that it charges very fast. It only takes about an hour to go for it to go from very low battery to completely full. I’ve read other reviews of the V2 Vertx Plus that claim it is a miniature fog machine, but the truth is that the vapor production of this device is fairly unimpressive. If you’re looking for monster clouds, there are far better devices on the market in the same price range. But if you’re interested in something that offers a smoking-like experience, the Vertx is perfect. It puts out about as much “smoke” as a cigarette, delivers a stronger throat hit than I get from my big mods and the V2 Red e-liquid cartridge included in the starter kit actually has a realistic tobacco taste. Having long moved on to tastier flavors, I can’t say I’ve enjoyed this juice too much, but I’m pretty sure ex-smokers looking for an authentic tobacco flavor will be very pleased with it. Th tight draw on the Vertx Plus cartridges also indicates that rather than giving advanced vaporizers a run for their money, V2 was more concerned with replicating the smoking experience to the smallest details. Again, if you’re expecting a whole lot of vapor from the V2 Vertx, you’re probably going to be disappointed, but if it’s a realistic smoking experience you’re interested in, I recommend giving this device a try, After all, not everyone likes big, fluffy clouds of vapor, especially if you don’t like attracting unwanted attention in a crowded environment. I found that adjusting the voltage on the V2 Vertx Plus doesn’t dramatically affect the vapor production. Yes, you’re going to get a bit more vapor at 4.5 V that at 3.5V, but the difference is minimal. However, the intensity of the throat hit delivered by the Vertx is significantly impacted by the voltage you’re running it add. If you prefer a mild throat hit, I suggest using it at the 3.5V setting, while if you enjoy a mule kick, 4.5V is definitely the sweet spot. 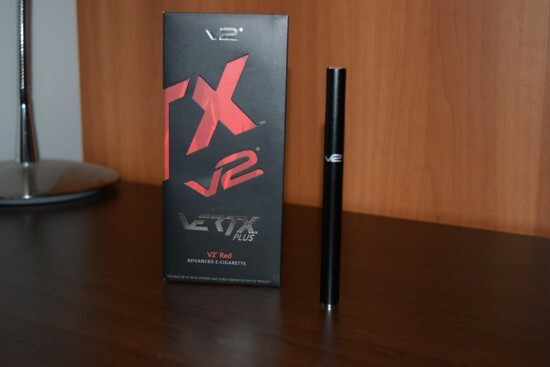 The V2 Vertx Plus is a great option for people looking for a smoking-like vaping experience. 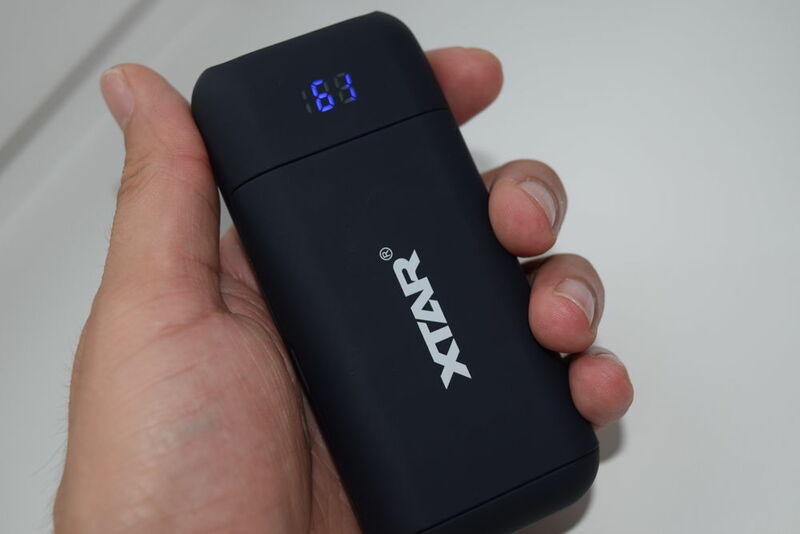 It’s super easy to use and carry around, the battery life, though not stellar, is definitely better than what you get from a simple cigalike, and it even has some cool features to fiddle with, like the small touchscreen and adjustable settings. Vapor production is on par with the smoke you get from a cigarette, the throat hit can be adjusted to your liking by increasing or decreasing power output, and the tight draw replicates the feeling of smoking a cigarette. That said, it’s by no means a perfect device. 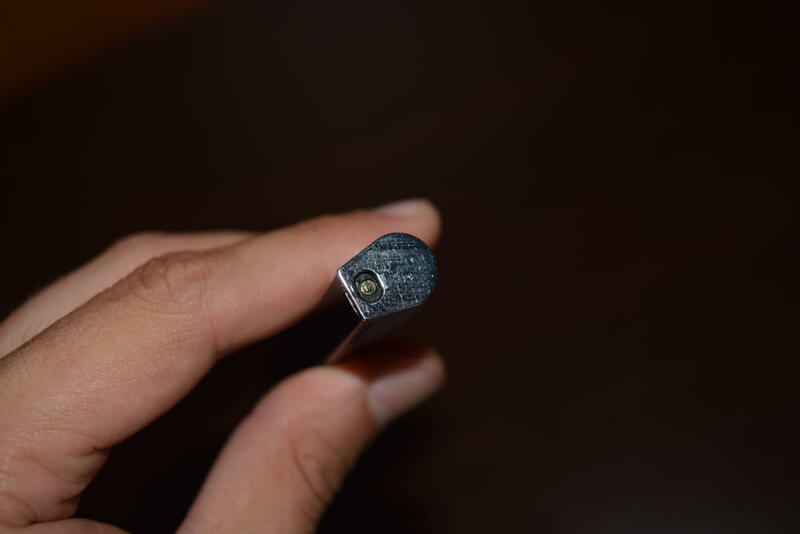 Although incredibly thin, the V2 Vertx Plus is also considerably longer than other vaporizers in its category, the power button is sometimes hard to operate due to its small size, and the fact that you can only get prefilled cartridges is also a con for people who want to save a few dollars by using their own juice. V2 Cigs has announced that empty cartridges will be available in the near future, but that was not the case at the time of this writing. I’ve recommended VERTEX to my friends and coworkers and 3 of them have already ordered theirs! I can’t say enough good things about this product. i smoked cigarettes and vaped for years, but i couldn’t completely drop the smokes. VERTEX is the only thing that worked. and i did it without even noticing!!! Amazing product. worst experience ever, failed to work straight out of box. 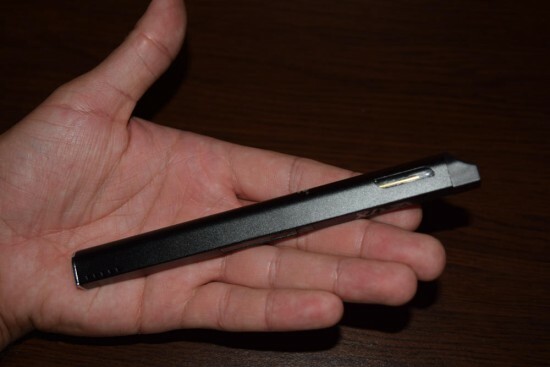 necesito un cargador para mi vertx plus vivo en puerto vallarta mexico donde lo puedo encontrar?? ?